Matthew Peterson: Let me ask you a bonus question here. Matthew Peterson: I thought this would be a fun story. You told me a very interesting story of your first job as a newspaper writer, do you mind sharing with everybody your story of how you got that job? James A. Owen: [laughs] I don’t mind. When I was just out of high school, I’d actually had several years of experience as an illustrator, but wanted to get into something a little bit more creative and I thought I’d like a job as a newspaper man. I was going through a very serious Clark Kent stage. And I decided that’s what I’d like to be is a newspaper reporter, but found out very quickly that you’ve got to have things like a degree in journalism to be a newspaper reporter. James A. Owen: Also, if you just walk in and ask for a job they’ll usually point you to like the loading docks. And that wasn’t exactly what I had in mind. So I took a cue from a story I’d heard about Steven Spielberg and Universal Studios. Where he went on the Universal tour in a suit with his father’s briefcase that had nothing but a sandwich in it and a name plate that read “Steven Spielberg, Director.” And he left the tour, found an empty trailer on the Universal lot and set himself up in an office. And basically just talked his way in to having an office on the Universal lot. James A. Owen: So I had done some work for some printers and built up some credit and I took one of the business cards from this newspaper and basically made up my own business cards and gave myself a title of “Editorial Intern” because I figured if I was an editorial intern nobody would squawk at that. Talked my way into the editorial department by showing them the business cards, then found an empty desk where I had a little name plate that I had made up to match the other name plates there and then basically survived because I was a decent enough writer that I could rewrite pieces for the editors on the spot. I couldn’t type, but I figured out that if you did errands for the secretarial pool they would more than gladly type up anything I needed typed, while I learned how to type. And then this was also early enough that everybody was starting to switch things to computers, but nobody was really used to it yet, and so when payday came around I went to my editor and told him I hadn’t actually gotten a pay check. James A. Owen: And he basically cursed the new computers for losing the information and then sat there and entered my information on the spot. And it took several months and I got through a couple of promotions before I ended up taking another job with another company. And it wasn’t until my going away party that somebody figured out I’d never actually been hired. James A. Owen: No one could remember interviewing me. I just suddenly had shown up and had the hutzba to just talk my way into a job. But the important thing when I tell people--especially students--this story is it’s not just having the boldness of going in there and doing something. I had to be able to write. James A. Owen: I had to be able to write fast and cleanly and do it on demand. That’s the requirements of a job at a newspaper, and if I hadn’t been able to do that then all the boldness and business cards in the world wouldn’t have done me any good, but yeah, that was . . . [laughs] one of the early adventurous episodes of my young writing career. Matthew Peterson: Yeah, that was a very unique story. That definitely takes some courage to do something like that. You know, I don’t think I could ever do something quite like that. [laughs] Just walk in with a name tag, and there you go! James A. Owen: A lot of times when people are having problems like that, what they want is somebody that says, “I can fix this.” That’s half of it is somebody saying, “I can do this for you.” And if you’ve had enough experience where you can demonstrate that you’ve done this before. That’s the other half of the battle. Matthew Peterson: I thought that was really funny when you shared that story that first time. James A. Owen: You know, I haven’t talked about where it was in many years, because I said which newspaper it was once. James A. Owen: As in other people trying to do it. Matthew Peterson: Trying to do the same . . .
James A. Owen: Just to see if they could get a job. Matthew Peterson: Yeah. How funny. How funny. James A. Owen: Every once in a while . . . I actually heard that story told at the BYU Management Society. James A. Owen: In Mesa. My roommates were like the secretary and editor of the newsletter for the BYU Management Society and we went to this banquet and one of the speakers was an executive from like Zion’s Bank. James A. Owen: And he tells this story of an example of entrepreneurial spirit. James A. Owen: Not realizing that the guy the story’s about it in the audience. Matthew Peterson: Is in the audience. James A. Owen: All of my friends are sitting there laughing while this guy’s telling the story ‘cause he has no clue I’m there. But that was pretty cool. Matthew Peterson: Yeah, that’s funny. I just realized that I forgot to ask you a question that I wanted to ask. And I thought this would be good. I hear that Warner Bros bought the rights to Here There Be Dragons. Any news on that? James A. Owen: [laughs] Actually as of last December we got the rights back. James A. Owen: They had only optioned it. They hadn’t purchased it, and the producers that had taken it were David Goyer, who wrote the Batman movies and David Heyman who makes the Harry Potter films. And just Heyman being involved got me a lot of attention when Here There Be Dragons came out. And I wrote the first draft of the screenplay for Warner. And then it was a matter of just waiting for the schedules to work out, and then they decided to split the last Harry Potter film into two movies. James A. Owen: And that pushed anything that David was going to do many years ahead. So we got to the point where Warner was going to renew the options, and we discussed it with them and decided that we wanted to go in a different direction. And it would have been nice to continue to work with David Heyman, but on the other hand, when we did the original deal with Warner, it was an unknown book; I was a fairly unknown author and they saw it as taking a lot of risks. And now I’m being published in a lot of countries, and we’re into our sixth hard cover printing on Here There Be Dragons and the fourth book in the series is out. So it’s a much better position to be discussing with studios, and hopefully there’s going to be some announcements about the new movie studio. James A. Owen: Well, even one that doesn’t do as well as anybody expects, take Eragon. James A. Owen: Eragon was not a wonderful movie. It didn’t perform as well as they wanted, and Chris still sold like 11 million books. James A. Owen: If that’s a flop, you know, bring it on! Matthew Peterson: Yeah. Bring it on. Definitely. Yeah, so that’s exciting, though. I’ll be looking forward to that. 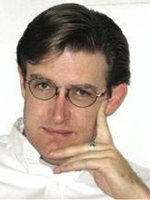 James A. Owen: Me too! Matthew Peterson: It would be definitely a good book to become a movie. James A. Owen: Thank you. Now when they put out the press release, the weekend before the book went on sale... And the bad part about that was they gave away the big secret at the end of the book. James A. Owen: In like the first paragraph. Matthew Peterson: So I was careful not to do that ‘cause I could tell that you didn’t want to reveal that, so I didn’t. James A. Owen: We’re still getting enough new readers that I try to hold back, but it was like in all those reports. James A. Owen: But at the same time, you know, that meant the week before my book went on sale my name got connected to Harry Potter. James A. Owen: Which got huge exposure. James A. Owen: Oh, I know, that gave us a boost. Matthew Peterson: Yeah. That secret is . . . I mean, people aren’t scared to share secrets, you know, the endings of books and stuff like that in amazon reviews and stuff like that. James A. Owen: Oh, yeah. James A. Owen: [laughs] Right. I’ve been a little more lax about it because we’re basically four books in. James A. Owen: If people have read them enough to even start buying them, they’ll come across it. If they haven’t then it’s kind of a, “Oh really? Well, now I’m going to go look it up.” So I’m not quite as worried about it as I used to be, but it’s still fun when people hit it cold. James A. Owen: And then hit that surprise not seeing it coming at all. Matthew Peterson: Yeah. It’s like Ender’s Game. You know, that’s the type of thing. It’s like, you cannot tell the secret to [Ender’s Game], ‘cause the next book is totally different. James A. Owen: Yep. That’s the easy one. When I start getting into the Latin names of Islands and things, then it gets complicated. Matthew Peterson: Yeah. I can imagine. Matthew Peterson: So I wanted to ask you a question about Star Child and the Mythworld series. Tell us a little bit about your comic book writing with Star Child and then a little bit about Mythworld. I know Mythworld is in German, right? James A. Owen: German and French, yeah. Matthew Peterson: German and French, so it’s not as known here in the U.S., but tell us a little bit about those two. James A. Owen: Star Child was the comic book series that I wrote and illustrated starting in 1992 and going through most of the ‘90s. It was basically my dark and stormy night stories, is what my friends called them. I’d always loved comics. I’d started in comics actually as a teenager in the mid ‘80s. So Star Child was my first big project. And somewhere in the mid ‘90s I started getting fan letters from an author named Kai Myer, who really loved these comic books. And it turned out that he was a very, very famous novelist in Germany, and we started a correspondence. And one day he asked me if I would be interested in actually writing a prose novel. And I told him I was. And it turned out he was approached by a publisher to conceive and edit a series of novels that could be sold with his name on the cover, kind of like the Tom Clancy books now. Tom Clancy’s NetForce and Op-Center are actually written by other people. But they use his name in the title to get the sales recognition. James A. Owen: And Kai was creating this series called Mythworld. And he asked if I would be interested in writing one of these seven books. And so he sent me about 3 pages of notes. I was going to write the second or third in the series. So I wrote book two with no existing book one and sent it into him. James A. Owen: And it turned out none of the other authors he’d contacted had even started, so I wrote up twenty more pages of notes and ended up writing the rest of the books. And that’s what gave me the experience of prose writing, to be able to do the Chronicles of the Imaginarium Geographica and the fact that I had done 6-700 pages worth of Star Child is what gave me the experience to illustrate it. So the books I’m doing now are kind of a culminating point from what I learned doing Star Child for a number of years and then writing the Mythworld novels. James A. Owen: That was a bit of a challenge. Matthew Peterson: Yeah, I can imagine. James A. Owen: I gave him a caveat of, “Hey, I don’t even know anything about these other characters.” There weren’t even any real characters invented yet. He had some general ideas about it having to do with the Wagner festival, the Ring operas in Bayreuth Germany. And my character was supposed to be about a young American journalist who turns into the Russian witch Baba Yaga. That was the whole outline. It had to do with this Ring opera and the world evolving into a mythological state where technology doesn’t work. And so I said, “You guys can throw out anything you need to, to make it work with the other novel.” And then he said, “Well, this is obviously a first novel.” And I already had some ideas for these other stories. James A. Owen: And it just worked out that I could write the other books. Matthew Peterson: Huh. Interesting. So that definitely gave you a nice springboard to do the Chronicles of Imaginarium. And the first book is Here There Be Dragons. James A. Owen: But also to some of the old classic novels, you know, Treasure Island, illustrated by N.C. Wyeth, Peter Pan in Kensington Gardens and Alice in Wonderland, illustrated by Tenniel, or Arthur Rackham. Matthew Peterson: Is there going to be another book after this one? Do you have more in mind? James A. Owen: There’s going to be several. I’ve art for book 5 on my drawing board right now and I’m writing book 6. So several more to come, at least, in this series. James A. Owen: And in the Shadow Dragons there’s one drawing where it’s a dinner party and you’ve got Percy and Mary Shelley, Nathaniel Hawthorne and Charles Dickens sitting at a table, and in the background on the walls I describe these tapestries that were just filled with all this imagery. And I actually drew the tapestries. It’s maybe four inches wide and seven inches long, and there may be 50 or 60 little scenes in this 4 x 7 inch square. Everyone here at the studio thought I was out of my mind. But it worked out. Matthew Peterson: Yeah, I think you showed me that. I remember seeing it and I remember seeing all the detail. Wow, I mean, the drawings are very detailed. They’re with a pen, right? Just pen and paper? James A. Owen: Yes, yep.